Stress Eczema is not caused directly by stress. Stress can make eczema worse. And having eczema can increase the amount of stress you may feel. But any tension felt does not cause eczema, it just affects it. It causes a reaction when the body thinks that there is a threat. The heart beats faster, blood pressure rises, muscles tense up and breathing becomes deeper and faster. These physical symptoms of stress can be a good or a bad thing. If they happen occasionally it will not have a long term effect on the body. It can be a positive thing. It can help you to take action towards a goal or it can help you make a decision that could help to keep you safe. These in turn could turn into more severe, or even life threatening issues. Feelings of tension are something that will be present at many stages of our life. Life throws things at us everyday. It is how we deal with them that determines how much they affect us. It is important to remember that children are affected by everyday issues too. There could be changes in your family structure, like divorce or the birth of a younger sibling. Problems at school can also be an issue. Bullying is devastating to a child. Children need to be able to relax the same way as adults need to. In relation to eczema, stress can cause irritation to the skin. This encourages scratching. And so begins the itch-scratch cycle. Suffering from eczema, or any other skin condition, especially if it is noticeable, can cause feelings of anxiety. Living everyday with the discomfort and the irritation can be stressful. But also how you feel about your own skin is very important. You have to learn to ignore hurtful comments from others. Easier than it sounds I know, but remember that the most important thing is how you feel about things. For your body's health it is important to minimize stress. 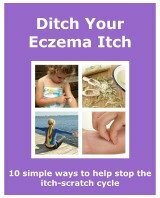 If the condition of your eczema is affected by how you are feeling then it is doubly important. I feel that looking at life in a light hearted way is a great start. Whatever life throws at you can be dealt with. It just needs to be dealt with in the right way. Its a cliché, but nothing is as bad as it seems. Change the way you look at things and they will appear different. Sorry if I'm starting to sound like a self help book. Its probably because I have read a few in my time! Combining a change of attitude and any or all of the following stress reducers will help not just your skin, but the health of your whole body. There are some ways that can help us deal with stress and anxiety better, and help to reduce the levels we feel. In turn this helps to reduce the chance of stress eczema. Here are examples of good stress reducers.